5:30pm ET: The Yankees just announced the deal. Good timing. Burns did receive an invitation to big league Spring Training. He’s the super early favorite to be 2019’s designated September pinch-runner. 5:29pm ET: According to Jon Heyman, the Yankees have signed outfielder Billy Burns to a minor league contract. He has big league time and I assume the deal includes an invite to Spring Training. Burns joins catcher Ryan Lavarnway, infielder Gio Urshela, lefty Rex Brothers, and lefty Danny Coulombe as minor league contract depth pickups this winter. Burns, 29, had himself a nice little season with the Athletics in 2015, hitting .294/.334/.392 (102 wRC+) with 26 steals and +3 WAR in 555 plate appearances. He was unable to build on that and has spent the last few seasons shuttling back and forth between Triple-A and the big leagues with the A’s and Royals. Burns is a career .270/.308/.353 (81 wRC+) hitter in nearly 900 MLB plate appearances. Last year Burns managed a .255/.314/.316 (68 wRC+) batting line in 425 Triple-A plate appearances with Kansas City, and they did not give him a September call-up. Over the last three seasons he’s authored a .271/.339/.321 (78 wRC+) batting line in almost 900 Triple-A plate appearances. Burns is a switch-hitting speed and defense type. A switch-hitting version of a poor man’s Brett Gardner, basically. The Yankees had to find Triple-A Scranton a center fielder this offseason and that led them to Burns. For all intents and purposes, he is the new Shane Robinson. Hopefully we don’t see Burns nearly as much as we saw Robinson. The Yankees still figure to add a journeyman innings starter on a minor league deal for the RailRiders at some point, otherwise they might be done with minor league signings. David Robertson is gone but Zach Britton has returned. According to multiple reports the Yankees and Britton have agreed to a complicated multi-year contract with a $13M average annual value. The team has not yet announced the signing and that probably won’t happen until next week. No biggie. For all intents and purposes, Britton received a two-year contract that includes a two-year club option and a one-year player option. It’s a smaller version of the Yusei Kikuchi/Jake Arrieta contract structure. Britton, Kikuchi, and Arrieta are all Scott Boras clients, not coincidentally. We’ll start seeing more of these contracts going forward. After year two of the contract, the Yankees first get to decide on Britton’s two-year club option. If they decline the option, Britton can either pick up his player option or enter free agency. Ken Rosenthal says the deal can max out at north of $50M. That’s less than the Giants gave Mark Melancon two years ago (four years and $62M). Britton’s contract pushes the Yankees over the $206M luxury tax threshold for the coming season, though possibly only temporarily. They had about $9M in wiggle room under the threshold following the J.A. Happ deal. They’re now roughly $4M over the threshold. Trading Sonny Gray could potentially clear up payroll space and bump the Yankees back under the threshold. Britton turned 31 last month and he threw 40.2 total innings with a 3.10 ERA (4.22 FIP) and a 73.0% ground ball rate last season. That includes 2.88 ERA (4.08 FIP) in 25 innings with New York. He was very good late in the season, as he got further away from his offseason Achilles surgery, and that’s the Britton the Yankees hope they’re getting. The Yankees will go into the season with Britton, Aroldis Chapman, Dellin Betances, Chad Green, and Jonathan Holder locked into five of the eight bullpen spots. They’re said to be looking for another reliever and have several in-house options (Luis Cessa, Domingo German, Joe Harvey, Stephen Tarpley, etc.) for the other bullpen spots. We’ll see how it shakes out. Friday: The Yankees announced the Tulowitzki signing earlier today, so it’s a done deal. No word on his number. Tulowitzki wore No. 2 with the Rockies and Blue Jays because he idolizes Derek Jeter. No. 2 is retired and No. 22 is taken (Jacoby Ellsbury). The Yankees could give him No. 12 and bump Tyler Wade to No. 14, which is the number he wanted last year before the Neil Walker signing. Well, whatever. Tulowitzki’s number is a #thingtowatch. “I can’t say what it would take us out of, but we’re going into this with a commitment level to try Troy Tulowitzki at shortstop,” said Brian Cashman during a conference call, adding it’s been made clear Didi Gregorius will be the starting shortstop when he returns. It’s been reported that, if the Yankees manage to sign Manny Machado, they would play him at third base and Tulowitzki at short. Also, it turns out Tulowitzki had multiple workouts for the Yankees before signing. To clear a spot on the 40-man roster, righty A.J. Cole was designated for assignment. 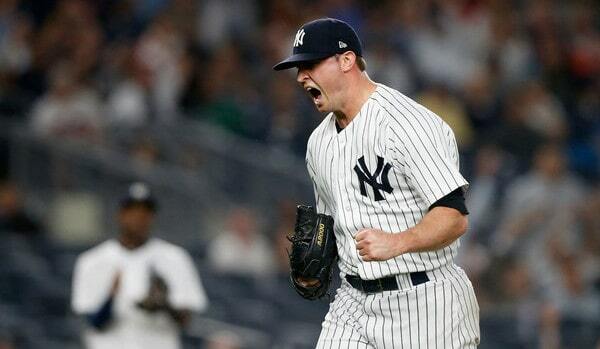 He had a nice little two-month run last season after coming over from the Nationals in a cash trade, but he really fell apart in the second half, and Cole finished the year with a 4.26 ERA (4.92 FIP) in 38 innings in pinstripes. He did have a 29.2% strikeout rate, so that’s cool. My guess is Cole will be traded for cash or a player to be named later. I don’t think he’ll clear waivers and remain in the organization a non-40-man roster player. Tuesday: According to Jeff Passan, the Yankees have agreed to a one-year deal with free agent infielder Troy Tulowitzki. The contract is pending a physical, which is no small thing given his injury history. The Blue Jays released Tulowitzki last month and still owe him $38M the next two years. The Yankees are only responsible for the pro-rated portion of the league minimum ($555,000). Tulowitzki, 34, has not played since July 2017 due to various injuries, including a pair of heel surgeries. He hit .249/.300/.378 (79 wRC+) in 260 plate appearances when healthy two years ago. The Yankees have never been shy about bringing in former stars as reclamation projects (Darryl Strawberry, Eric Chavez, etc.) and Tulowitzki fits the mold. Watch him hit .300/.350/.475 or something. Passan says that while Tulowitzki is expected to play shortstop while Didi Gregorius rehabs from Tommy John surgery, the signing doesn’t take the Yankees out of the running for Manny Machado. It’s a low cost, low risk signing that’s easy to back out of should a better option come along. This signing is more about adding depth than bringing in a no-doubt solution to the middle infield situation. It’s worth noting that, when he worked out for scouts last month, Tulowitzki said he’s willing to play second or third base, but he doesn’t want to be a utility man. If he makes the Opening Day roster, either he’s going to start somewhere or he’s had a change of heart about the whole utility player thing. We’ll see. Anyway, one or two clutch doubles and you’ll all love him. So long, Parker Bridwell. It was a good run. The Yankees lost Bridwell on waivers to the Angels earlier today, both teams announced. He was designated for assignment earlier this week to clear a 40-man roster spot for the newly re-signed J.A. Happ. 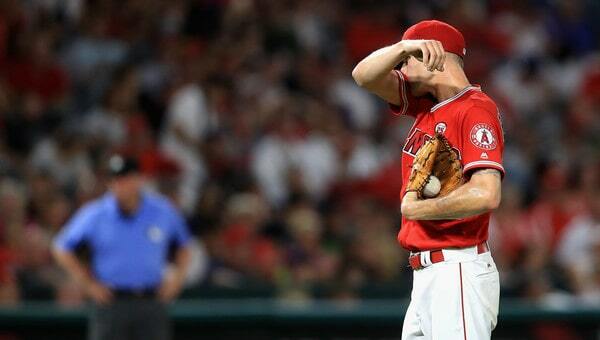 The Yankees originally claimed Bridwell off waivers from the Angels last month, and now the Angels claimed him back. A reverse Ronald Torreyes, basically. The Yankees lost Torreyes on waivers to the Angels in January 2016 and reclaimed him from the Halos a few days later. Bridwell, 27, allowed 40 runs in 34.2 innings between Triple-A and the big leagues this past season before needing surgery to remove loose bodies from his elbow in June. Coincidentally enough, Bridwell was one of the high spin, high whiff pitchers who made my recent under-the-radar relievers list. Even with Bridwell gone, the Yankees still have three out-of-options sixth starter/reliever candidates in Luis Cessa, Domingo German, and A.J. Cole. Tommy Kahnle is out of options as well. The Yankees have signed left-handed reliever Danny Coulombe to a minor league contract with an invitation to Spring Training, the team announced earlier today. He joins lefty Rex Brothers, catcher Ryan Lavarnway, and infielder Gio Urshela as minor league depth signings this offseason. 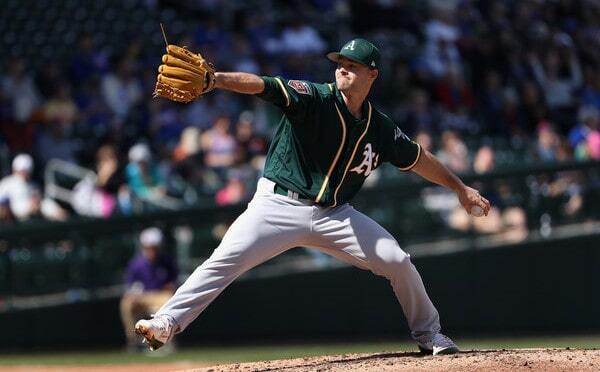 Coulombe, 29, has spent the last three seasons as an up-and-down arm with the Athletics. He had a 4.56 ERA (5.10 FIP) in 23.2 big league innings and a 2.54 ERA (4.20 FIP) in 28.1 Triple-A innings this past season. For his big league career, he has a 4.27 ERA (4.09 FIP) with a 22.2% strikeout rate and a 10.1% walk rate in 143.1 innings. Coincidentally enough, Coulombe was on the list of 68 relievers I identified as a possible under-the-radar bullpen target using spin and swing-and-miss rates. It’s not big velocity at all (averaged 90.6 mph in 2018), but Coulombe can really spin his fastball (2,307 rpm) and breaking ball (2,466 rpm). Coulombe is a left-on-left matchup guy at this point. He’s held lefties to a .234/.304/.327 (.280 wOBA) batting line in his big league career. Righties have pounded him for a .245/.339/.455 (.339 wOBA) line. Coulombe is out of minor league options, so if the Yankees call him up at some point, he has to go on waivers to go back to Triple-A. If you’ve been reading our weekly chats long enough, you know Coulombe was a personal favorite once upon a time. I thought that breaking ball gave him a chance to become a sneaky good bullpen piece. Hasn’t happened though. Maybe it still could. Coulombe’s already an extreme anti-fastball guy (only 26.9% fastballs in his MLB career) so he’ll fit right in with the Yankees. Friday: The Yankees announced the Brothers signing earlier today. He did indeed receive an invitation to Spring Training. Joel Sherman report Brothers will earn $800,000 at the big league level and, if he’s not on the MLB roster by July 31st, a team in Japan or Korea can purchase his rights for $100,000. 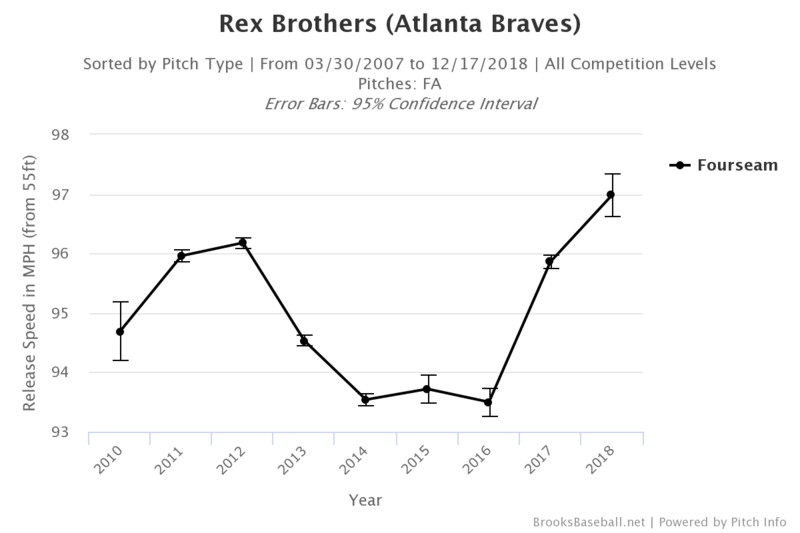 Wednesday: According to Jon Heyman, the Yankees have signed journeyman lefty reliever Rex Brothers to a minor league contract. I assume he received an invitation to Spring Training. Brothers is the third depth player the Yankees have signed to a minor league deal so far this offseason, joining catcher Ryan Lavarnway and infielder Gio Urshela. Brothers, who turns 32 today, was a pretty big deal with the Rockies a few years ago, but injuries and control issues have hampered him this last few years. 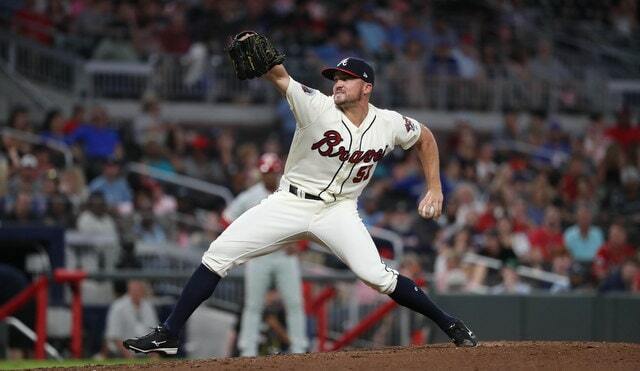 This past season he pitched to a 6.20 ERA (4.84 FIP) with 27.5% strikeouts and 21.6% walks in 40.2 innings split between Double-A and Triple-A with the Braves. That is 56 strikeouts and 44 walks in 40.2 innings, plus 17 wild pitches. Yeah. At the moment the Yankees are looking for two relievers, and while I’m sure we’ll see Brothers during Grapefruit League play, I don’t think he has a real shot at cracking the Opening Day roster. Consider him a reclamation project and a depth arm. A veteran to soak up some innings in Triple-A to help keep the actual prospects from being overworked. If that newfound velocity sticks and Brothers is pumping 97-98 mph with some semblance of control with Triple-A Scranton early next season, great! The Yankees will make room for him. If not, well, no big deal. It’s a no risk minor league signing. As far as I’m concerned, a lefty with some MLB success to his credit and this sort of velocity is always worth a minor league deal.